Measure interior dimensions quickly and reliably with the lightweight and handy telescopic measuring stick Nedo mEasure-fix compact 10’. Simply place the mEasure-fix compact 10’ in position, pull out the extending sections and conveniently read off the measurement from the analog display. Ideal in interior outfitting. 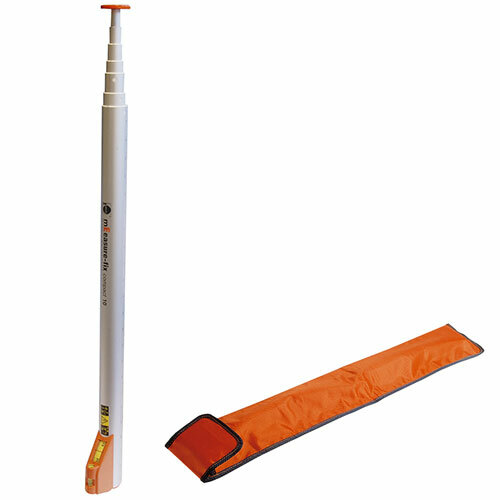 Nedo mEasure-fix compact 10’ is very handy thanks to its compact dimensions, its light weight and its round telescopic tubes. The display is attached at the foot of the mEasure-fix compact 10’, so when measuring windows, the measured values can conveniently be read off at eye level. A two-way bubble is integrated into the display housing to facilitate taking horizontal and vertical measurements.